Q: We have a number of Northern Catalpa trees on our property; three very large ones that are a focal point of our yard and some smaller ones that I suspect came from seed shed by the large trees. We have caterpillars on the trees every summer, but they have previously never been overly destructive—and I've noticed signs that tachinid wasps have been laying their eggs on the caterpillars in the past, so I pretty much ignored them. This year, however, the caterpillars have completely defoliated a few of the small trees and are everywhere. I also don't see any sign of the wasps' eggs on them. 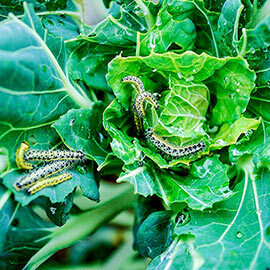 There are so many caterpillars that I was considering using some Bt on them. But I've read that despite defoliation, the caterpillars aren't really harming the trees. What would be your recommendation about these creatures? ---- Laura "in Pennsylvania, near Phoenixville"
…Which sounds exactly like the life cycle of the tiny parasitic wasps I'm always talking about, except for size. Most parasitic wasps, like the members of the well-known braconid family, are only as big as the period at the end of this sentence; so they generally aren't even seen by people. Tachinids are the size of houseflies, and they—and their eggs—are very visible. 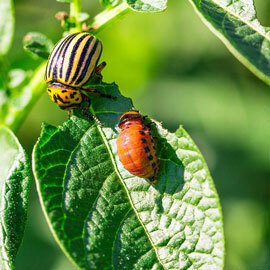 But again, both insects do the same thing—use their eggs to prey on caterpillars. I'm not sure why Laura had so few tachinids this season, but that could account for the excessive defoliation. The flies may have previously kept the caterpillars in check. But there's certainly no reason to panic. We get calls about this problem every year, and I've come to the conclusion that although it is visually disturbing, it's perfectly normal and doesn't hurt the tree. But it is one of the strangest symbiotic relationships I've ever come across. At some point in the season, huge numbers of caterpillars will appear in catalpa trees; so many caterpillars that the trees can sometimes be completely defoliated, but not harmed. At least not normally. There are reports of trees being killed after years and years of unendingly heavy defoliation, but these appear to be the exception to the rule. 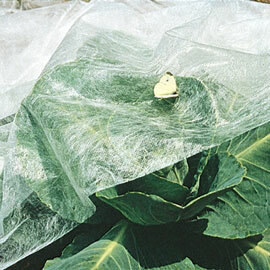 And a great UDSA Bulletin on the topic adds that the initial feeding by the caterpillars causes the injured leaves to release huge amounts of nectar—nectar that attracts lots of ladybugs and other beneficials, including perhaps, the tachinid fly itself. So just leave it alone? For a one-year event, absolutely. AND be sure to collect and offer the caterpillars to local bait shops and anyone who likes to go fishing. The so-called 'Catalpa' or 'Catawba worm'—two of the common names for the caterpillar attacking these trees—is a prized bait for catching fish. These are very interesting trees. They're late to leaf out and early to drop their leaves, which may explain why they don't seem to need a lot of time for photosynthesis. They also produce one of the most amazing flowers of any tree—the blooms look like corsage orchids. So, I would use the original form of Bt—a non-toxic, organically-approved product that's been around for decades—to control any infestations during the flowering period. Anyway, if the 'worms' attack after the flowering period, it's a coin toss. You can certainly spray the tree with Bt without guilt (the adult forms of the 'worm' aren't anything special*) if you want to stop the defoliation. Or just leave it alone and collect and sell the 'worms' for fishing bait. *These caterpillars ('worm' is unfortunately part of the common [and incorrect] name of many caterpillar pests) turn into a fairly nondescript member of the sphinx moth family. They are not interesting members of that family--like the amazingly cute hummingbird moth or the HUGE adult sphinx moths produced by tomato and tobacco hornworms. Anyway, a little bit about tree itself: Two types, Northern and Southern; both native. The wood is soft, but very durable and rot resistant, like cedar and redwood. It's great for building things like compost bins and raised bed frames. Heck, it was once used to make railroad ties, so we know that its strong and durable! But it is also a "dirty" tree. Those pretty flowers make a slimy mess when they drop. And if the tree isn't defoliated by caterpillars, the seedpods—which are long, cigar-shaped and very cool-looking—need to be cleaned up or you'll get lots of little catalpa trees popping up. The tree can also drop limbs and become invasive. But on the upside it makes a great shade tree. Bottom line? I wouldn't plant it near a foundation, septic field or parking area, but I might install one just to enjoy those amazing flowers. And my son Max loves to go fishin'!